Erected 2007 by Polk County Historical Association. Location. 35° 15.133′ N, 82° 11.922′ W. Marker is in Columbus, North Carolina, in Polk County. Marker is on W . Mills St. (State Highway 108). Touch for map. Marker is in this post office area: Columbus NC 28722, United States of America. Touch for directions. distance of this marker); Polk County Bicentennial Memorial (about 300 feet away, measured in a direct line); The Brave Devoted Patriots (approx. 0.2 miles away); Tryon Mountain (approx. 2.3 miles away). Touch for a list and map of all markers in Columbus. More about this marker. This is the second relocation of this monument. 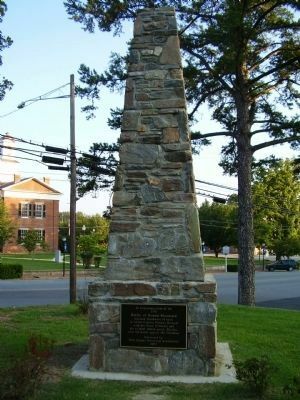 The Daughters of the American Revolution originally placed the monument, commemorating the Battle of Round Mountain, at Howard Gap in 1909 (coordinates currently unknown). The first relocation moved it to the side of Miller's Mountain, opposite Round Mountain, during construction of Interstate 26 in the late 1960s and 1970s at GPS Coordinates: N 35° 14.983 W 082° 16.406. Round Mountain is the hill immediately south of I-26 from these coordinates. Also see . . . Tryon Peak, Howard's Gap and the Battle of Round Mountain. A section about the Battle of Round Mountain, and this marker, in Footsteps of the Cherokees by Vicki Rozema (Published 2007). the Times-News (Hendersonville, N.C.) from May 16, 1977: Dedication Ceremony Held for Thomas Howard Monument, by Licia Guat. It was a little more than 200 years ago that Revolutionary War soldier, Capt. 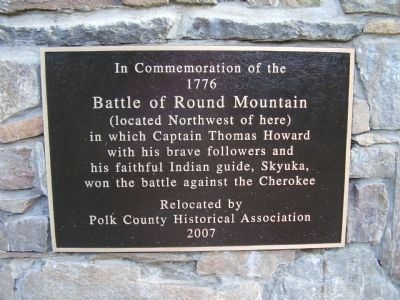 Thomas Howard and his faithful Indian guide Schuyuka (Skyuka) defeated the Cherokee nation at the Battle of Round Mountain. Yesterday, the descendants of Thomas Howard and the South Carolina State Society, National Society Daughters of the American Revolution, gathered on the windy hillside at Howard Gap to commemorate Howard's bravery and to dedicate a monument honoring him. The monument was restored last fall and erected on the east side of Interstate 26 by the North Carolina Department of Transportation. The tall stone monument stands on a hill to the right of the old Howard Gap Road and is visible to motorists traveling on Interstate 26 between Columbus and Saluda. 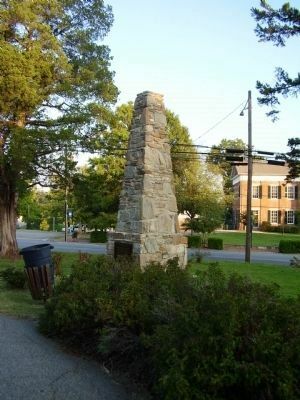 The monument was originally erected in 1909 by Tryon Council No. 143, Junior Order of United American Mechanics, to honor Howard. The original monument had two granite placques [sic] that read: "To commemorate the battle of Round Mountain in which Capt. Thomas Howard and his brave followers with the faithful Indian guide Skyuka, defeated the Cherokee nation in 1776." The caption reads: About 100 persons attended the dedication of Howard monument Sunday afternoon. Those participating in the dedication ceremony included (from left to right) Mrs. J.K. Cathcart, state chairman of the South Carolina DAR; Tim Clayton, fifth generation descendant; Grady Howard, direct descendant; Mrs. Fred W. Ellis Jr., state regent of the S.C. DAR, and Mrs. Henry B. Shealy, state chairman of the DAR Bicentennial. DOT) removed the monument from its original location on the Howard Gap Road and stored the stones in Columbus. 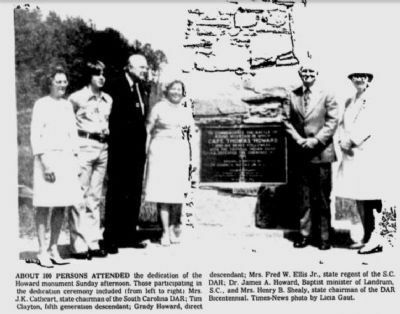 The descendants of the Howards of Upper South Carolina Organization purchased a new bronze tablet in 1967 to replace the old granite placques, which had been destroyed by vandals. Capt. Thomas Howard, born in 1760, was an early adventurer and pioneer of the "dark corner" of North Greenville County and was one of the first to organize a resistance to the Indian invasions that were threatening the outer settlements in North Greenville County. During the Revolutionary War, Capt. Howard, with a small command from the old Block House fort, was guided by Schuyuka through a gap in the mountains, now known as Howard Gap. The gap lies north of Round Mountain. This enabled Howard to gain the rear of the Indians and their Tory allies, who were encamped in the gap to the south of Round Mountain, known as Big Warrior. Howard and his force defeated the enemy, killing a number of them. Today, rock-covered mounds mark where the Indians buried their dead on the battlefield. Howard lacked one day of being 78 when he died in 1838. "Those 78 years came during the most crucial era of our great country's history," said Mrs. Henry Shealy at yesterday's dedication. — Submitted March 1, 2015, by J. Makali Bruton of Querétaro, Mexico. More. Search the internet for Battle of Round Mountain. Credits. This page was last revised on June 16, 2016. This page originally submitted on September 8, 2008, by Stanley and Terrie Howard of Greer, South Carolina. This page has been viewed 3,143 times since then and 36 times this year. Last updated on March 1, 2015, by J. Makali Bruton of Querétaro, Mexico. Photos: 1, 2, 3. submitted on September 8, 2008, by Stanley and Terrie Howard of Greer, South Carolina. 4. submitted on March 1, 2015, by J. Makali Bruton of Querétaro, Mexico. • Bill Pfingsten was the editor who published this page.